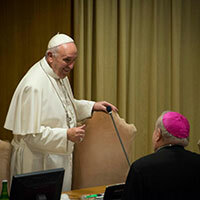 Pope Francis in the Synod Hall. Photo by Fiona Basile. 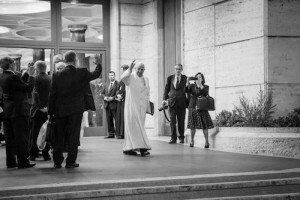 Pope Francis leaving the Synod. Photo by Fiona Basile. And without ever falling into the danger of relativism or of demonizing others, we sought to embrace, fully and courageously, the goodness and mercy of God who transcends our every human reckoning and desires only that “all be saved” (cf. 1 Tm2:4). In this way we wished to experience this Synod in the context of the Extraordinary Year of Mercy which the Church is called to celebrated. This entry was posted in Uncategorized on October 26, 2015 by ACBC Communications.